Available in 1ltr spray bottles. we will continue to see tragic incident's involving naked flames catching costumes alight. possibly save life's due to non fire rated fabrics. What Happens When A Non Fire Rated Fabric or Material Catches Alight? the unsuspecting child or person will only have a very short time if any to extinguish the flame. materials that will burn & melt. What Can Gater Guard Fire Retardant Spray Do? Gater Guard Fire Retardant Spray. Trigger spray method was used for coating the garments. 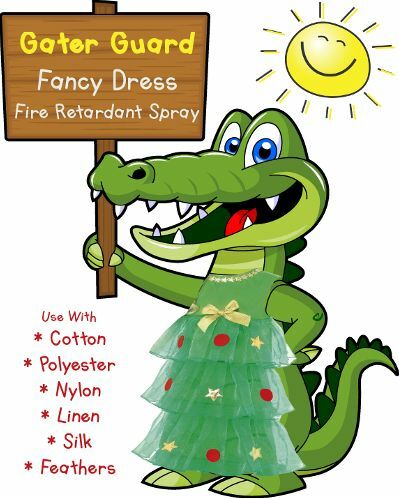 Application: To apply Gater Guard Fancy Dress Fire Retardant to a costume, using a coat hanger simply hang up the garment either outside or over a bath for example. Using the spray bottle trigger, spray approximately 6 - 8 inches away until the garment is completely soaked right through. Allow to dry by natural means such as a clothes line, DO NOT TUMBLE DRY! Remember this is a skin safe product, However we would recommend using gloves & a mask as this will not taste very nice should you get this in your mouth. Once the garment is completely dry you may see some signs of a white residue, this is perfectly normal use a damp cloth to wipe this off. Other visual differences is that the dress / costume may lose a little shine as the fabric retardant itself is not glossy. After Care: Wash the treated garment by way of the manufactures recommendation - please note once the garment is washed it will require treating again with Gater Guard Fire Retardant Spray. Coverage: 1ltr spray will cover approx: 8 m2 - Depending on custume size 3 - 4 garments. approx: 2 m2 coverage for the 250 ml travel spray bottle. This means you can use Gater Guard Fancy Dress Fire Retardant Spray again and again. natural & synthetic materials including clothing & seating. reaction with a full pass result. furniture that could be tarnished by some corrosive flame retardants. and Inspections. High active solids: 30% compared to around 15% of our competitors products. Quicker drying times. (Ready to use in 3-4 hours). Easy to apply. non-hazardous formulation and completely Odourless. Non Hygroscopic and Non-Corrosive to metals. Unlike our competitors products will not corrode metals. hessian, foam rubber and most other materials that can absorb. Treats up to 8 sq. metres per litre. Possibly more on light weight materials. Suitable for spray, dipping application.